Hi friends! I'm back with another project from Quilt Market. I really loved this project. It went together quick and I think the radiating color is stunning. Thank you so much for all the comments. I always enjoy hearing from you here on the blog. 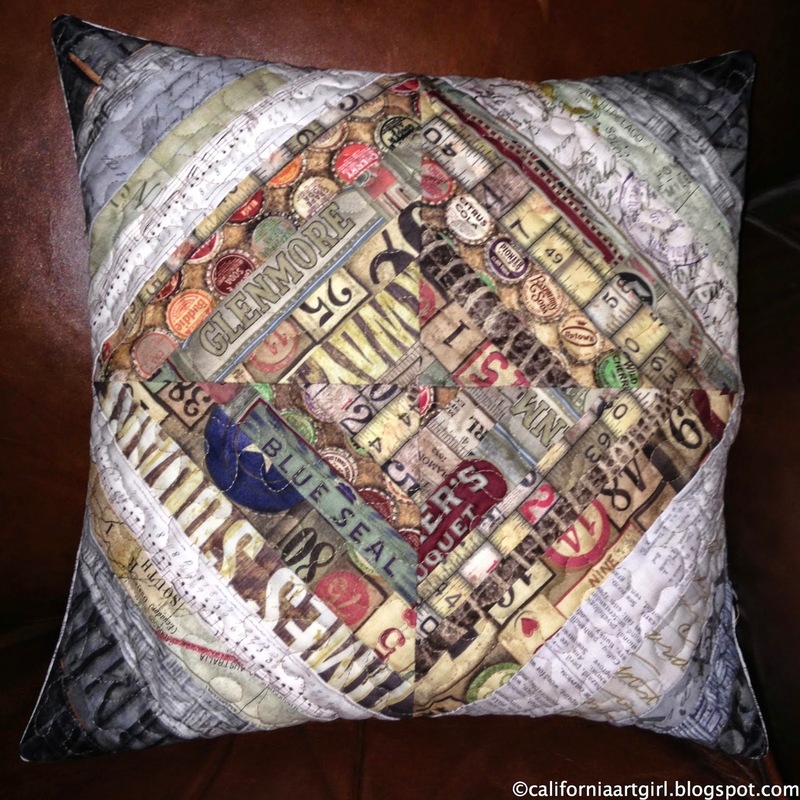 The pillow was paper pieced with random sized strips and then quilted. Cut 4 - 8" squares of paper. 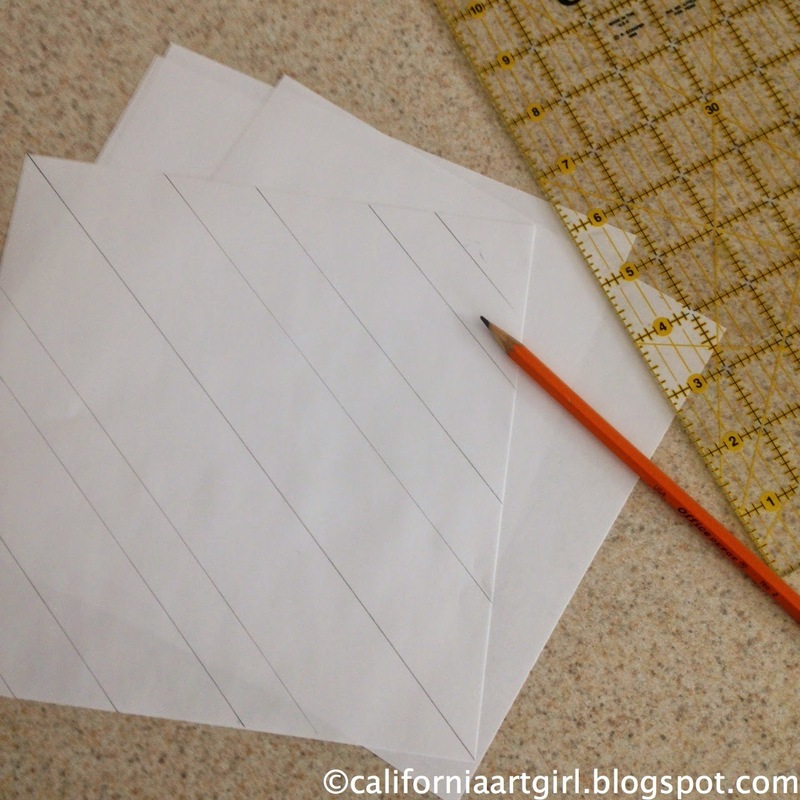 Draw several reference lines diagonally across the squares, this will help you sew the strips straight. 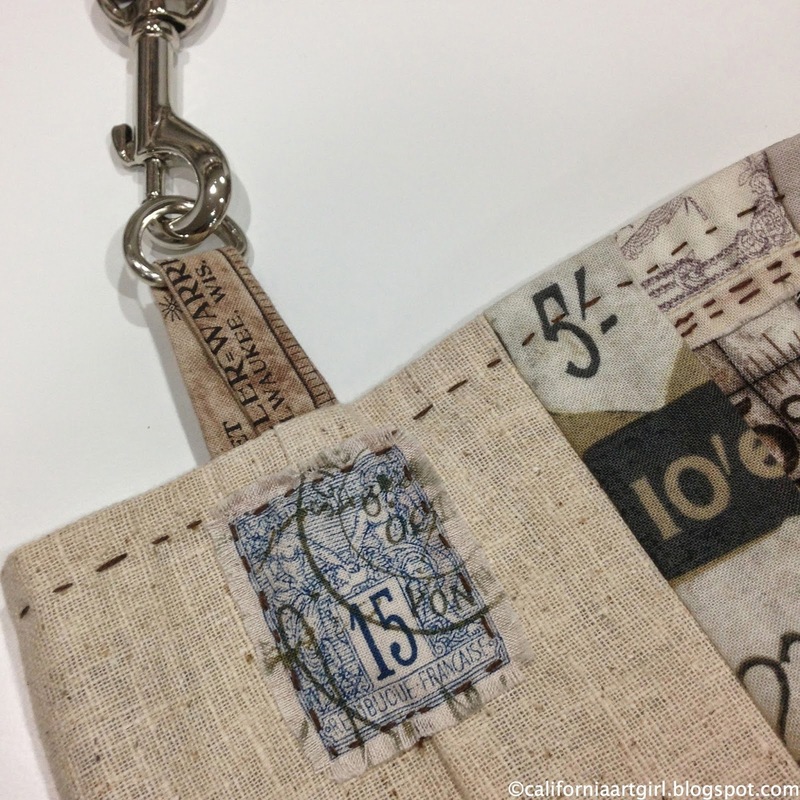 Cut several random strips from a wide rang of fabric. The strips are cut to anywhere from 1" to 2". The strips should be at least 12" long at the center of the square. Light, medium and dark colored fabrics. 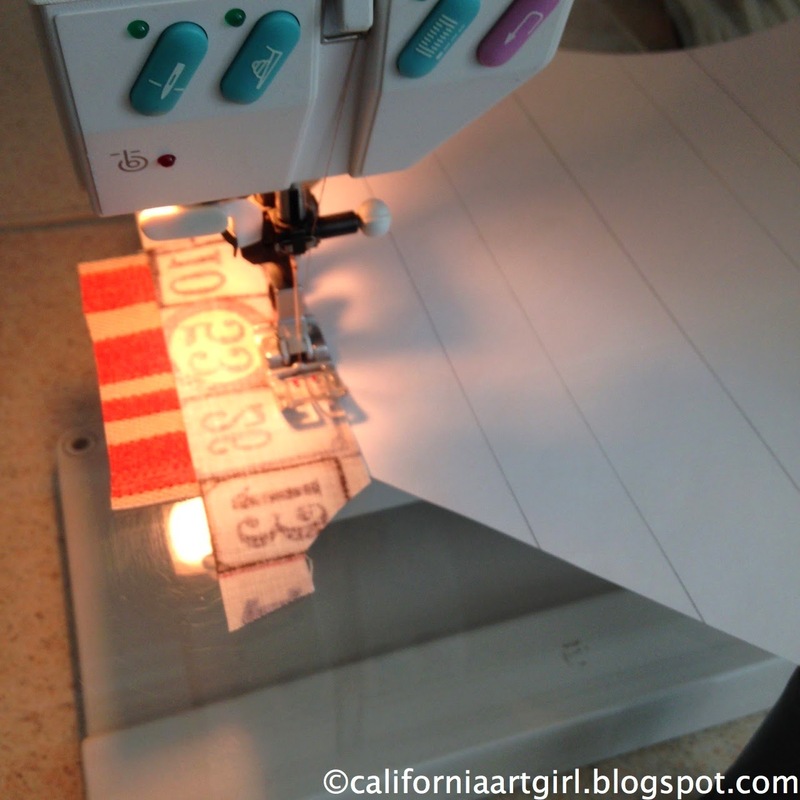 Start at one end and sew the fabric strips to the paper. 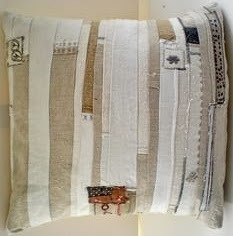 You can see that the center of the pillow starts with mid tones (browns and greens), moves to light neutral and then goes to dark colors (black). Make 4 of these squares. I tried not to use the same fabrics in the same place to create a random look. 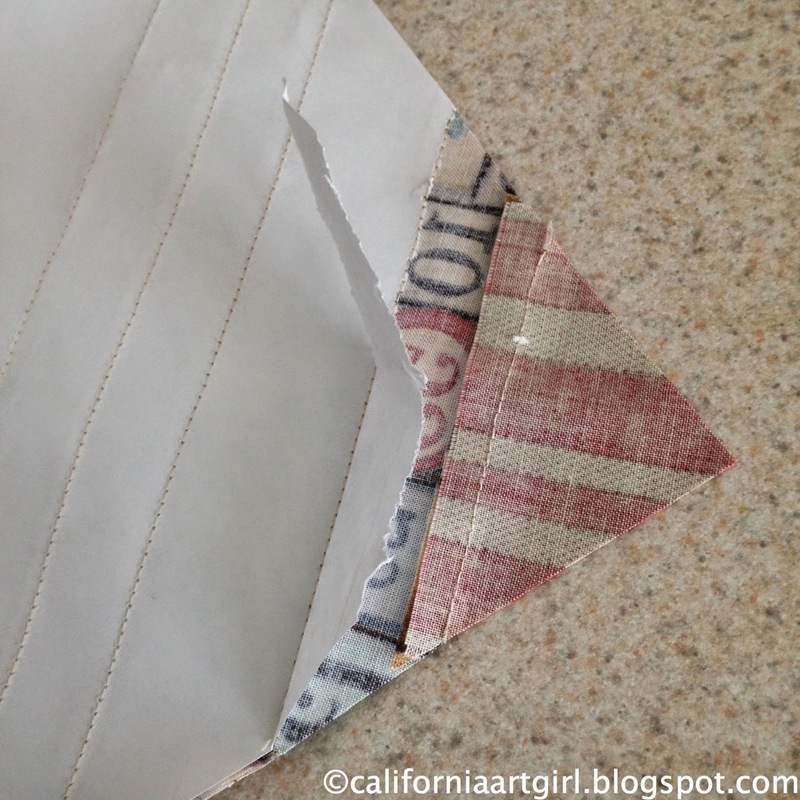 Once all the sewing is done carefully tear the paper off the back side. Trim the sewn squares to 7 1/2" x 7 1/2". Sew the four squares together matching the seams in the center using a 1/4" seam allowance. At this point you could just make the pillow but I decided to quilt it. This step is totally optional. Layer the sewn pieces with batting (Warm and Natural) in the middle and muslin or the like for the backing (this fabric will not show). Quilt through the layers. Construct your pillow by sewing around the edge with right sides together. Be sure to leave an opening for turning. 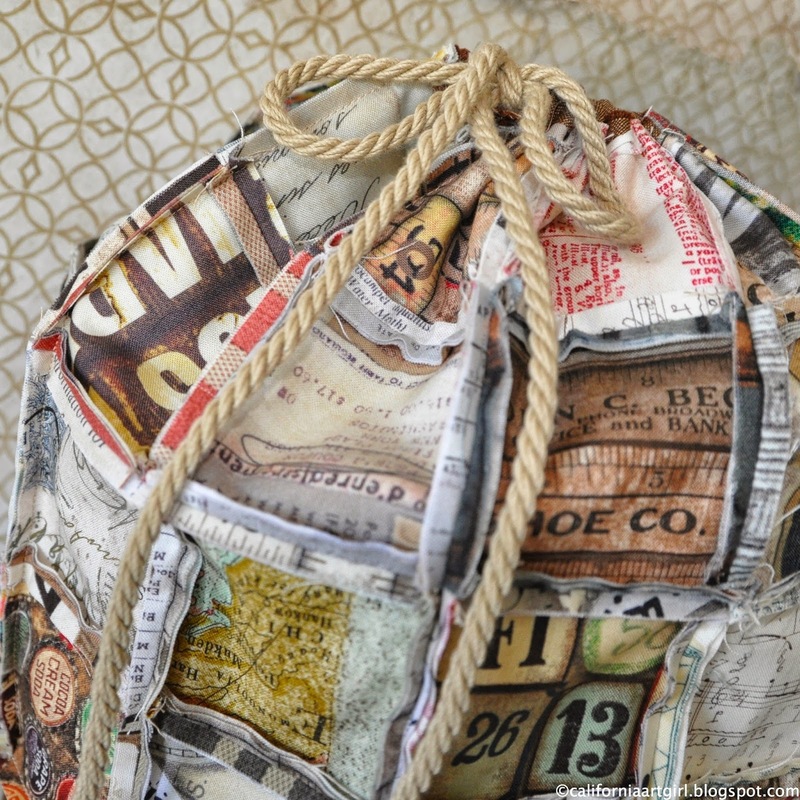 Make sure the opening is large enough to get the pillow form in, Hand stitch the pillow closed. 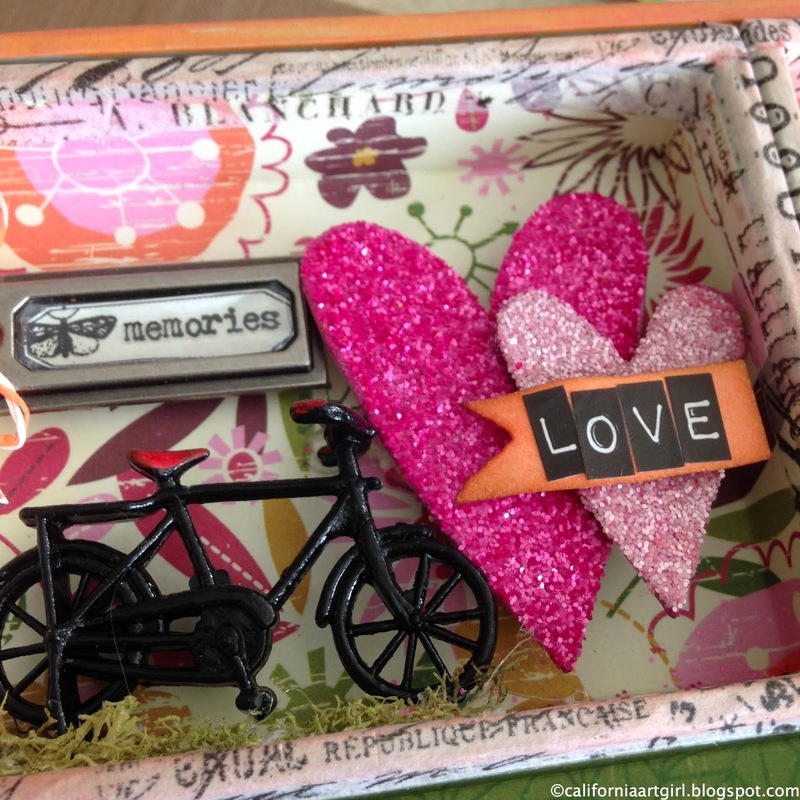 About 6 weeks ago Paula and I meet at Scrapbook Island in San Jose, California. She was teaching some classes there and I went to help and she brought me the soft, beautiful, vintage fabrics for me to make Quilt Market samples…I couldn't wait to get home and start sewing. Now to get inspired and make some projects to showcase the fabrics. 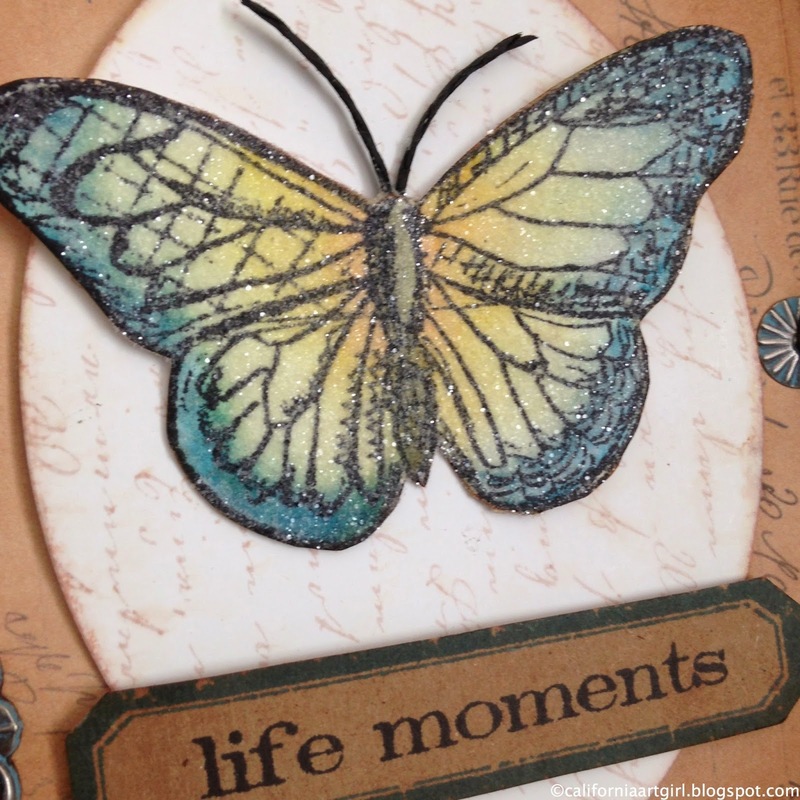 So...inspirations can come from many places and Pinterest is a great place to see lots of inspiration fast! So I opened a Pinterest account and started pining. Now I'm totally addicting! 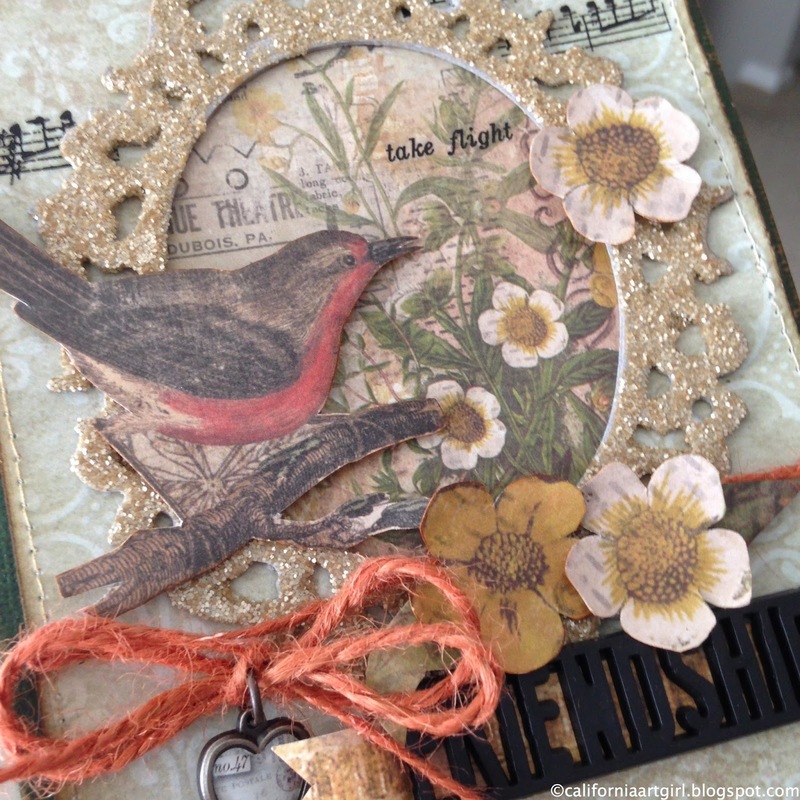 My Pinterest is "CaliArtGirl" "Richele Christensen" if you want to see what i've been pinning. 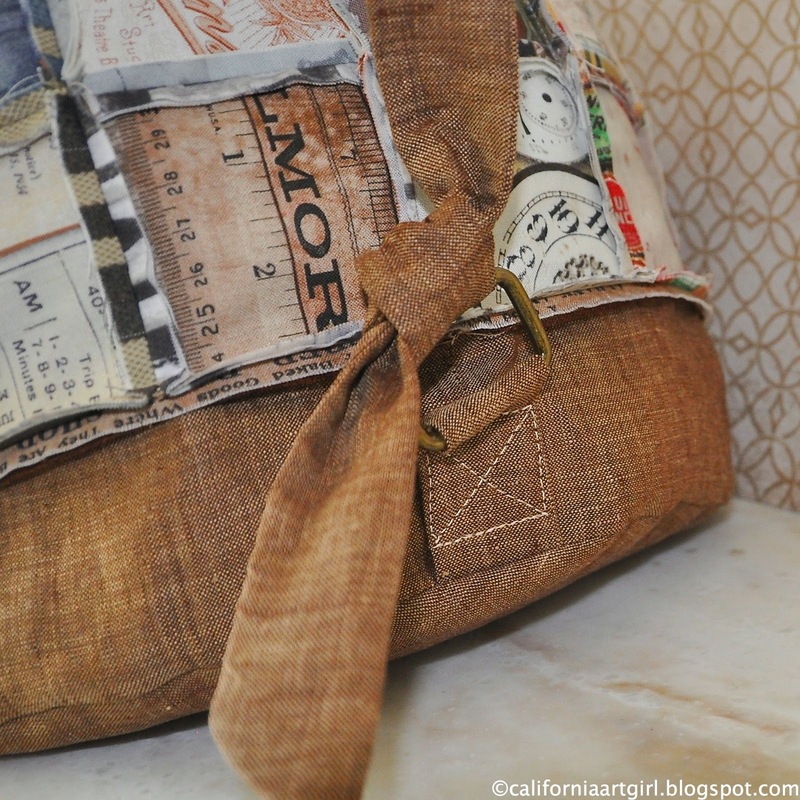 This tote was inspired from a few places, Pinterest and a photo Paula Cheney sent me that Tim had liked. So I was off and sewing. 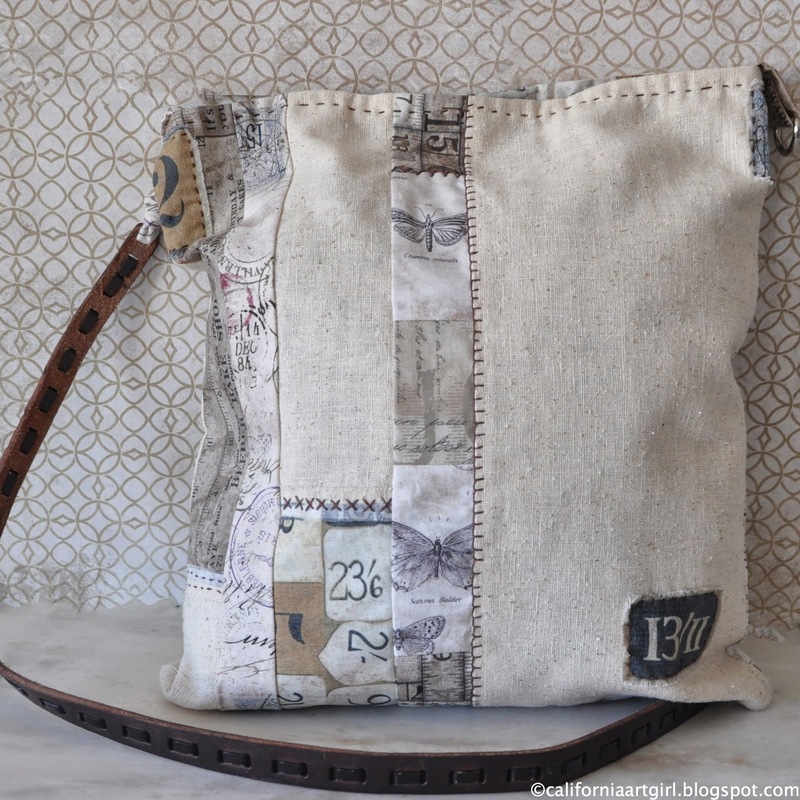 A deconstructed tote using fabric from both collections and a little osnaburg fabric. I sewed random strips together and even some raw seems out. It was fun sewing with no real plan and measurements. The strap is a leather belt Paula picked up at Goodwill then I cut it in half lengthwise with a rotary cutter. I was amazed at how easy it was to cut. I went to Home Depot and found a snap clip then the local shoe cobbler sewed it onto the strap for a small fee. Totally in love with the fabric lining, it's one of the new ones. I added some hand stitching using embroidery floss. Also fraying edges of the fabric is a fun. 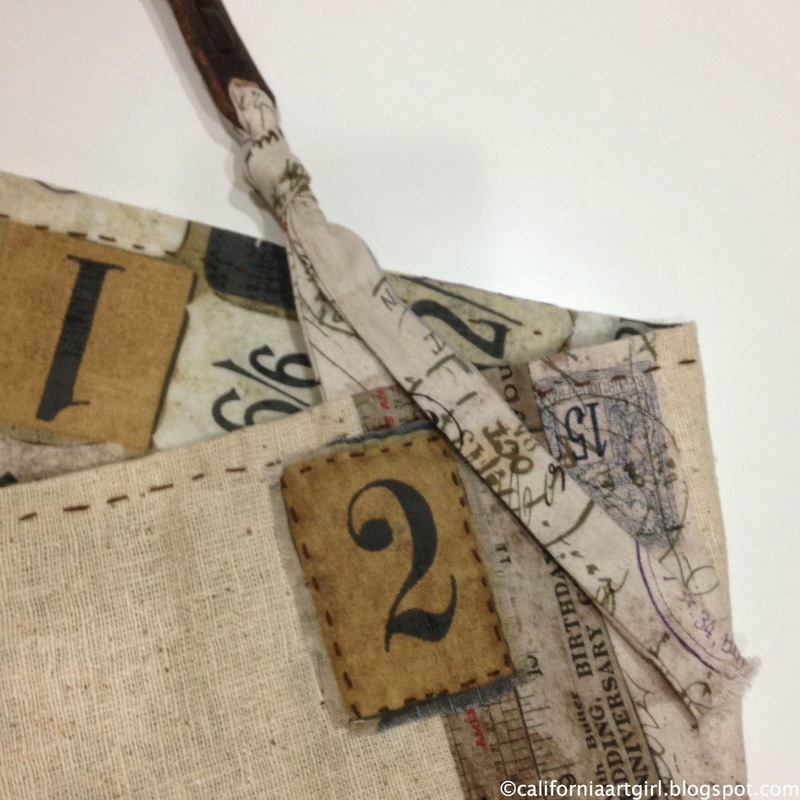 Eclectic Elements fabric has great details to key up on like the number 2. Here is how the snap clip attaches to the tote. 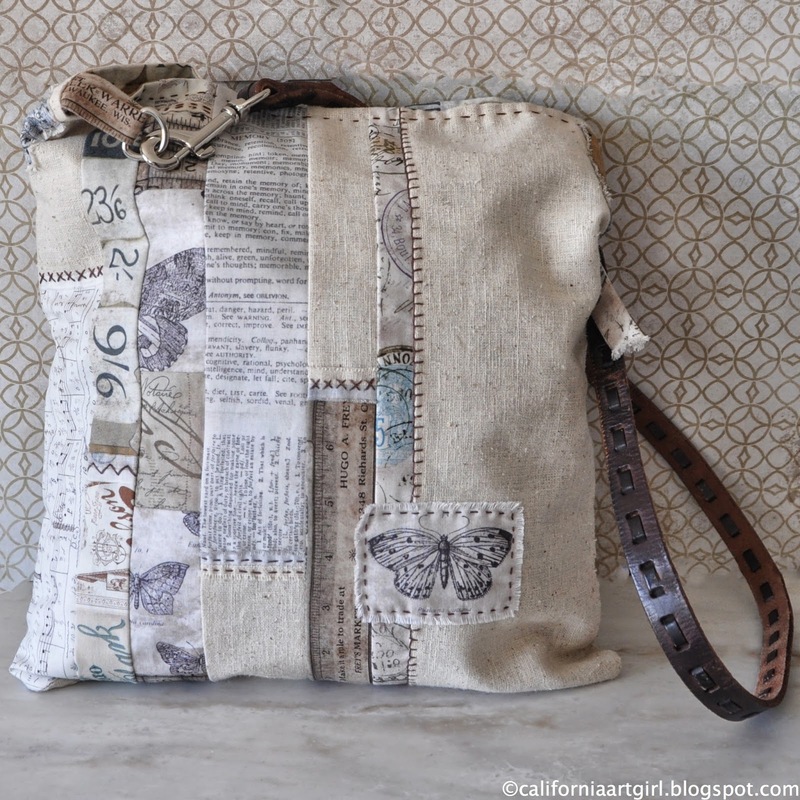 This is the inspiration for the tote from Pinterest. 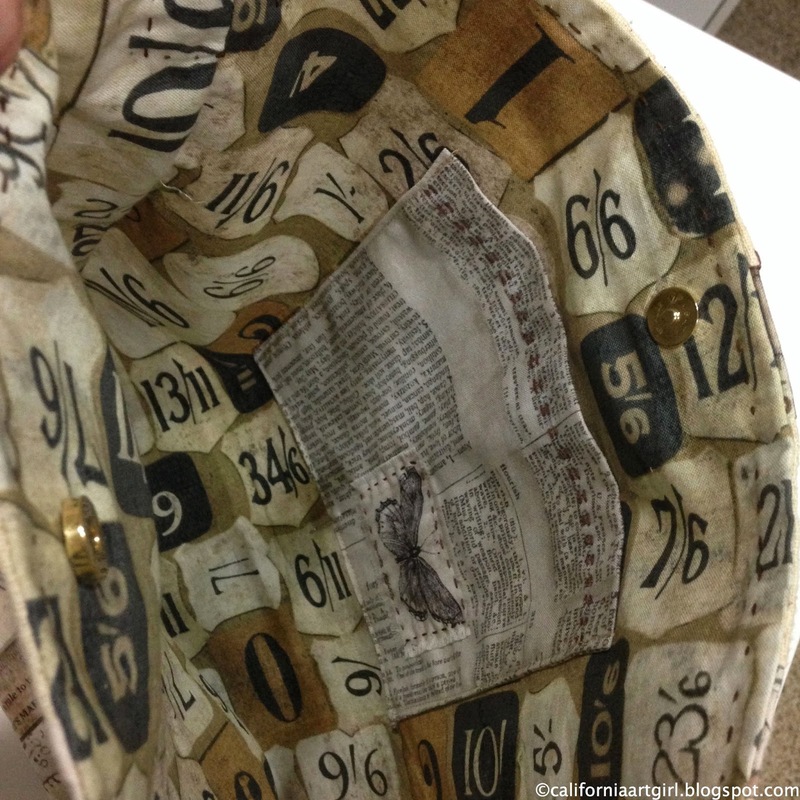 This is the piecing inspiration. Love how this tote came out I actually had a hard time sending it off! Thanks for all the nice comments, I love hearing from you! 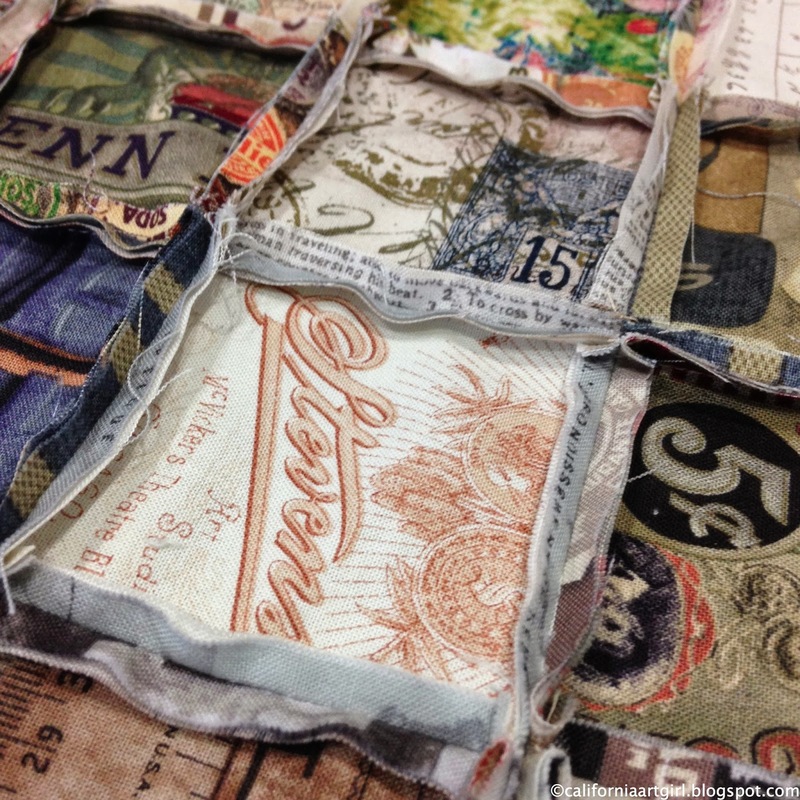 The Tim Holtz Eclectic Elements Fabric has just debuted at Quilt Market in Pittsburg. The 2nd collection is so AMAZING and coordinates so well with the first collection, you are all going to LOVE it! The fabric is 100% cotton, has a very soft feel and looks very vintage of corse. Here's a picture Mario took at Quilt Market...as they say a picture is worth a thousand words! Look at all that loveliness and that smile! PRICELESS! 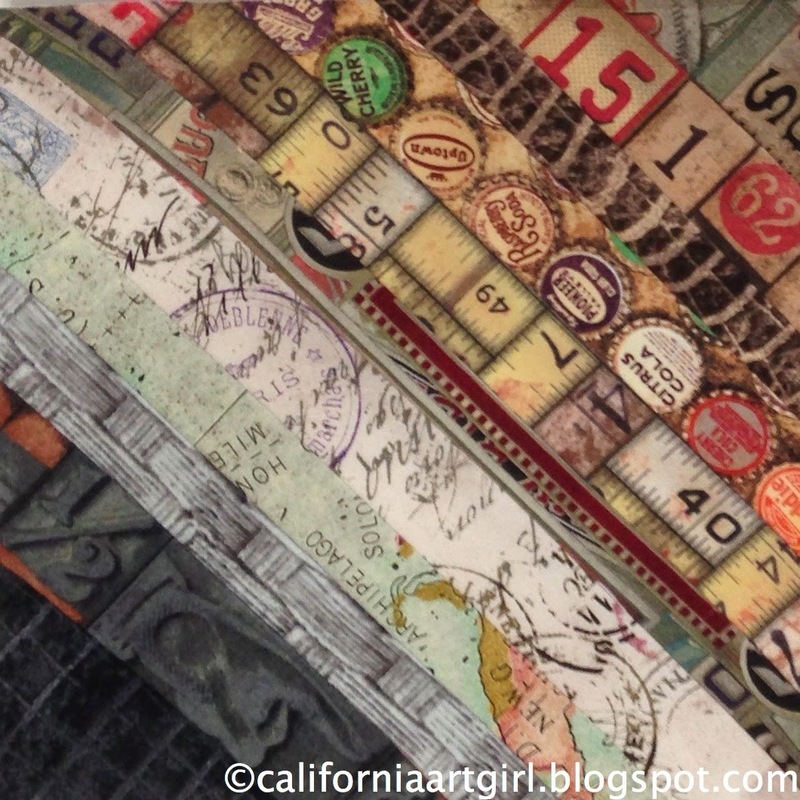 Don't forget to check out Mario and Paula on Instagram and Twitter for more peeks from Quilt Market. 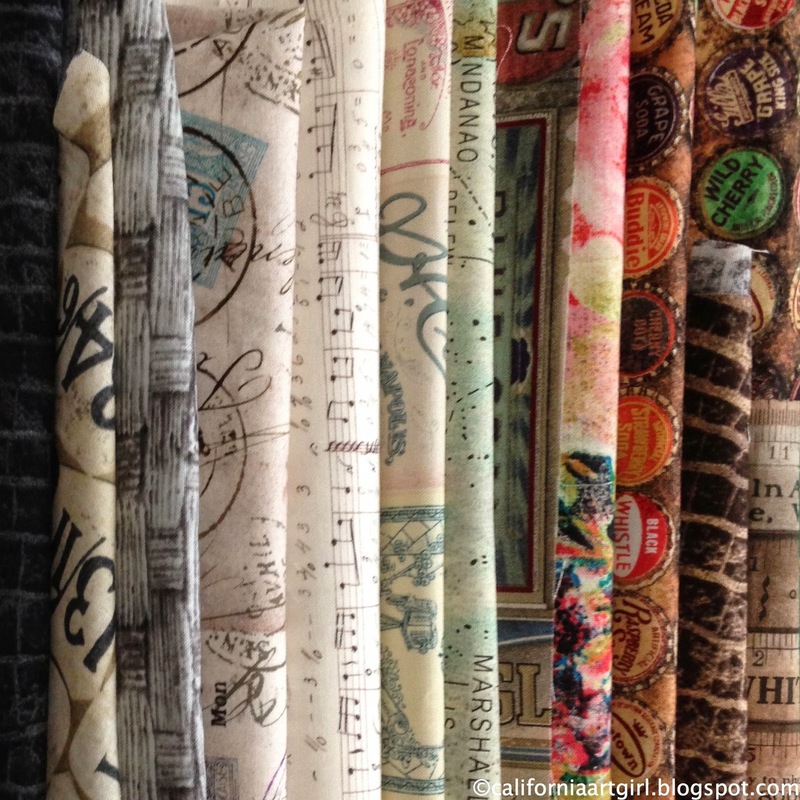 Here's a snippet of the new fabrics, 13 in all and the fabric is due to ship in June. The collection is very inspiring, I can't wait to sew more. 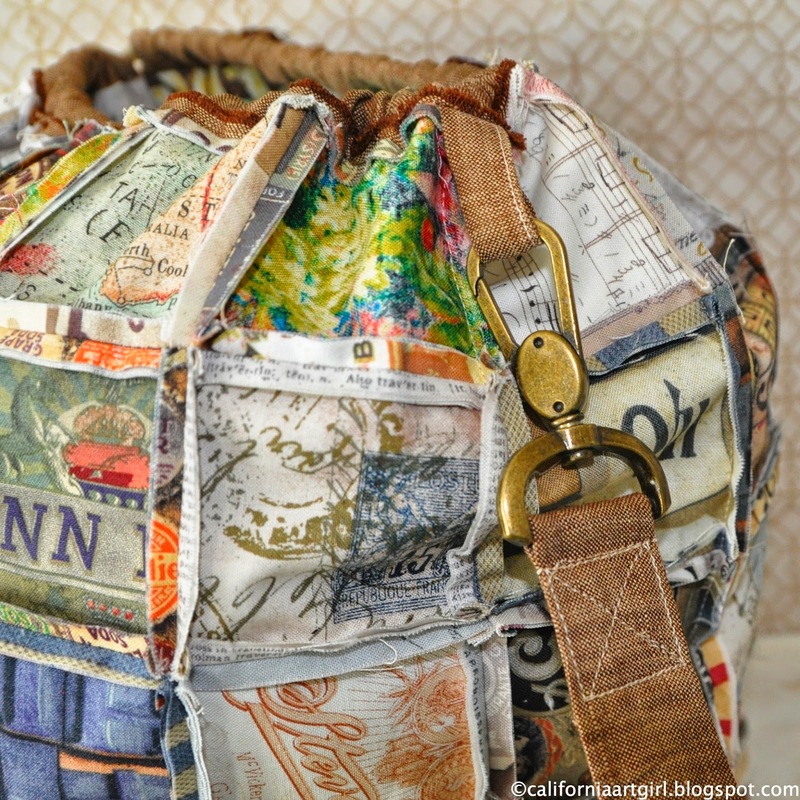 Project 1 - Patchwork Bucket Bag. 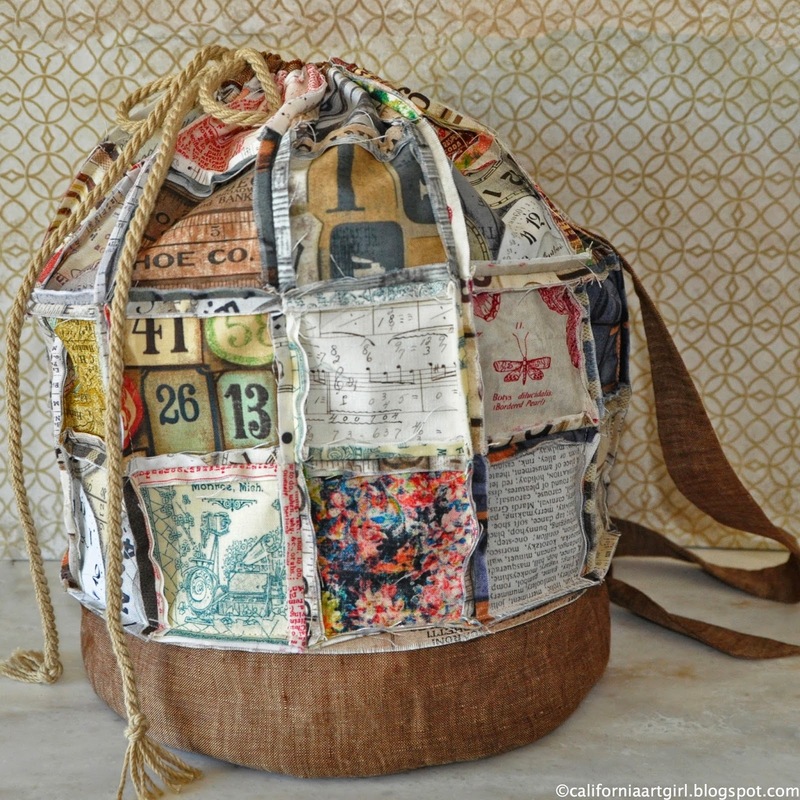 The bag is a mix from both collections of Eclectic Elements fabric along with some brown linen! 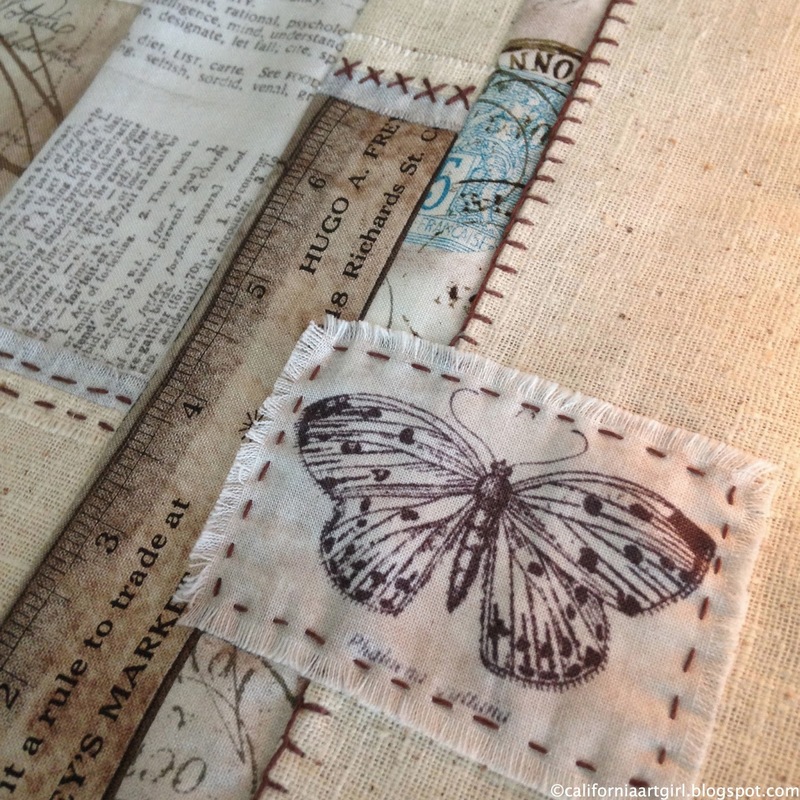 I think the brown linen is a perfect addition with the patchwork. 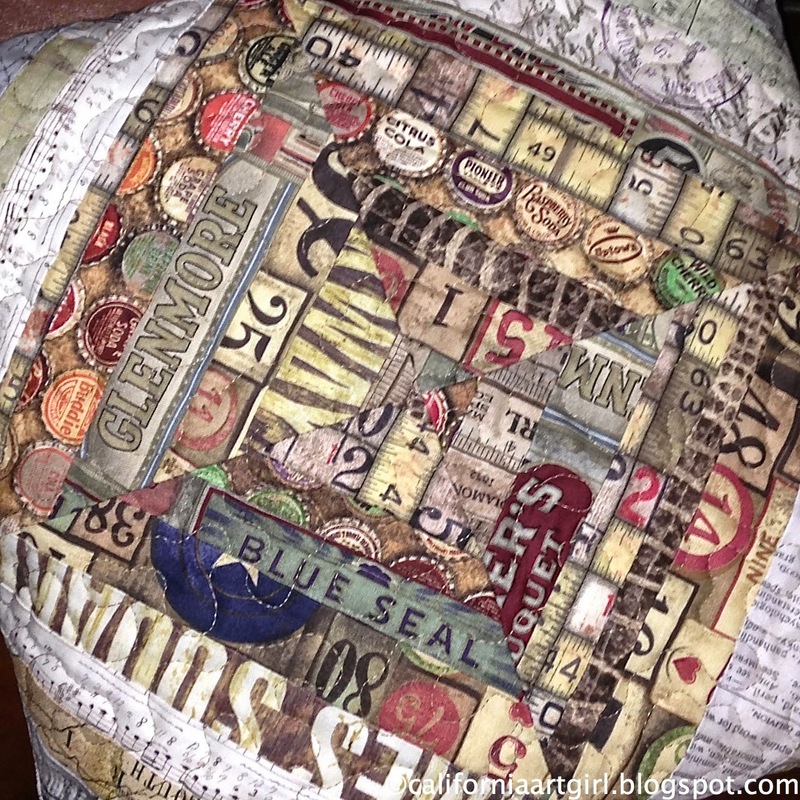 If you look close you will see that the patchwork was sewn together with the raw edges out for a deconstructed look. Here are a few detail shots! 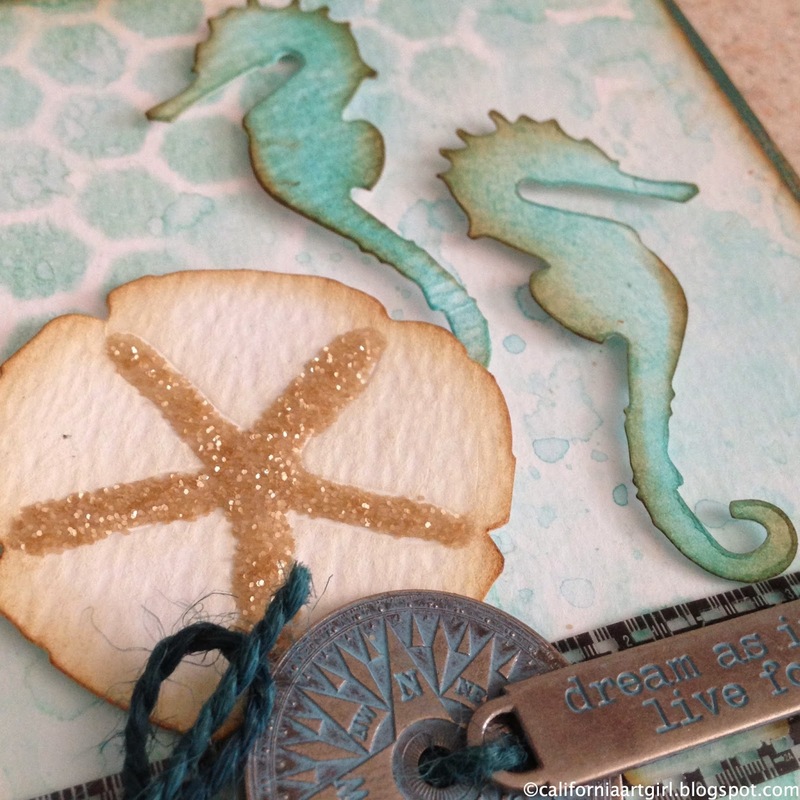 Stay tune...I have lots of projects I'll be sharing here on the blog! 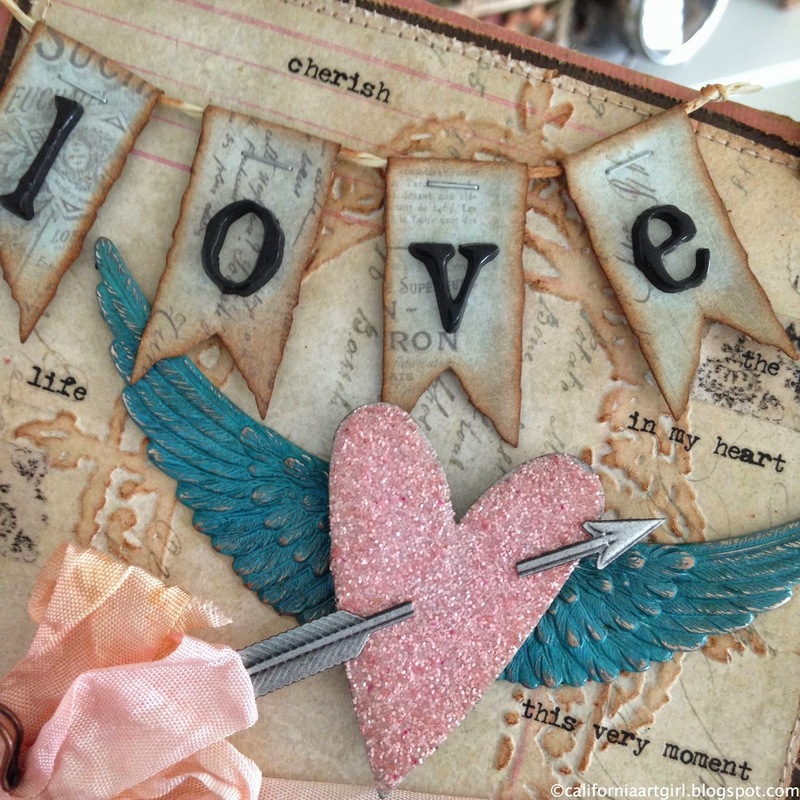 Check out more inspiration from Tammy Tutterow, she has an unbelievable Grungy Owl she made with amazing details! Hi friends!! 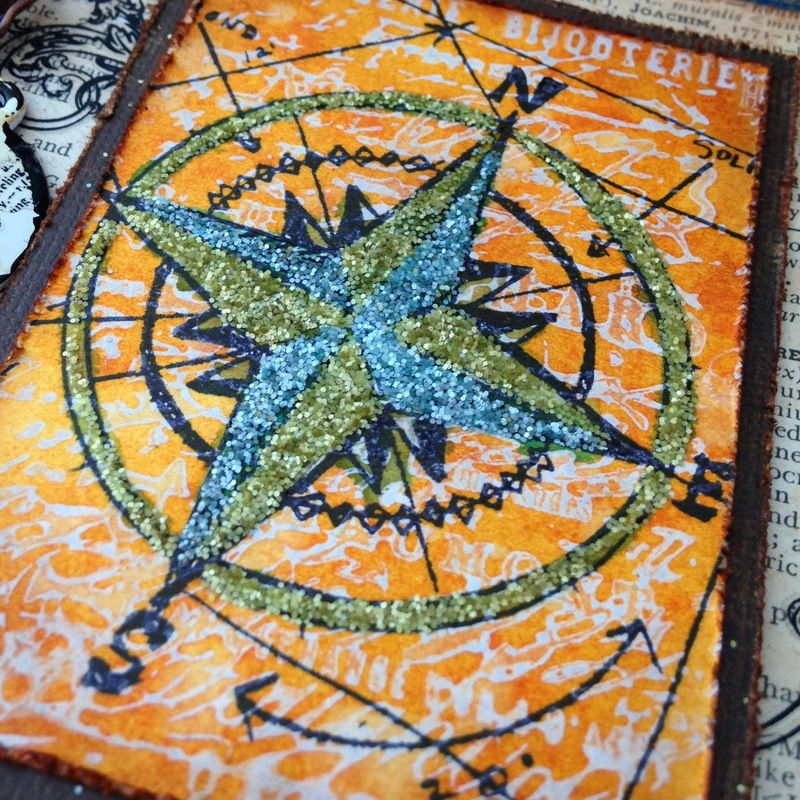 Today it's all about Distress Glitter and the Compendium of Curiosity 3 by Tim Holtz aka CC3. The Compendium of Curiosity 3 is an awesome challenge that anyone can join. Even you! To learn more about the challenge head over to the beautiful Linda Ledbetter's blog. If you need a copy of Tim's book you can get an autographed copy here. 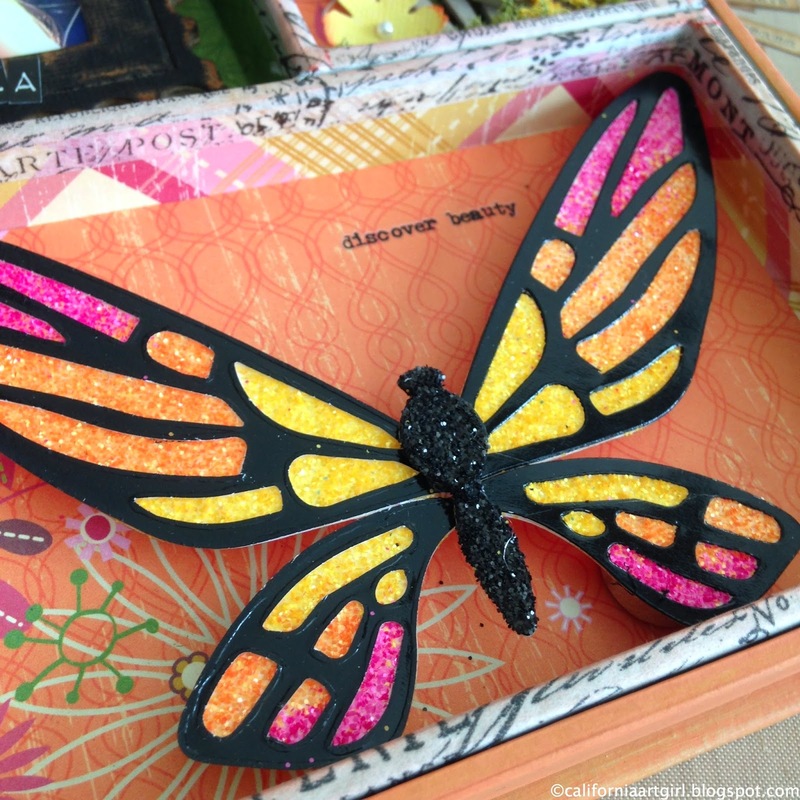 The second challenge is all about Distress Glitter!!! 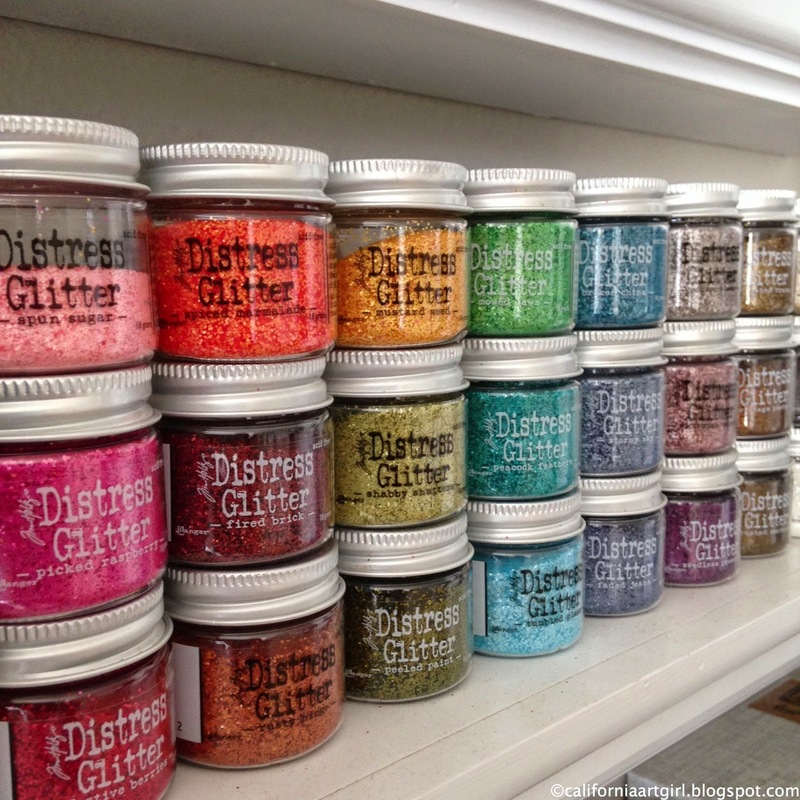 If you love a little sparkle you will love Distress Glitter! It's like putting a little sugar coating on your project and look at all the beautiful colors. Here are a few projects I've made. As you can see it makes a great addition to your projects. I hope you will join in on the challenge! Linda is even giving prizes away! 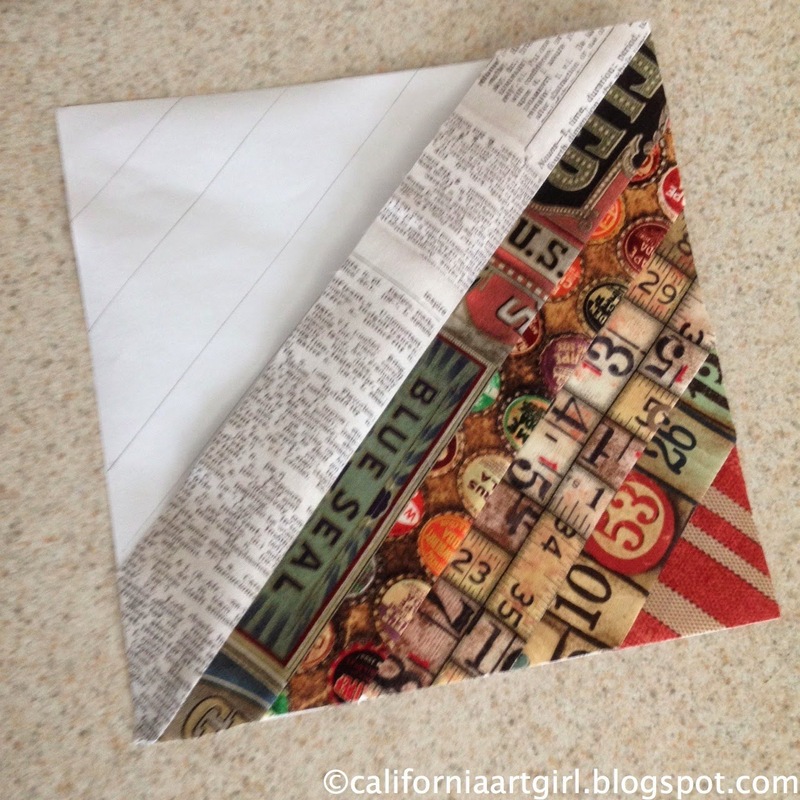 I'll be back soon with some fabric projects I made for Quilt Market with Tim's new Eclectic Elements Fabric.